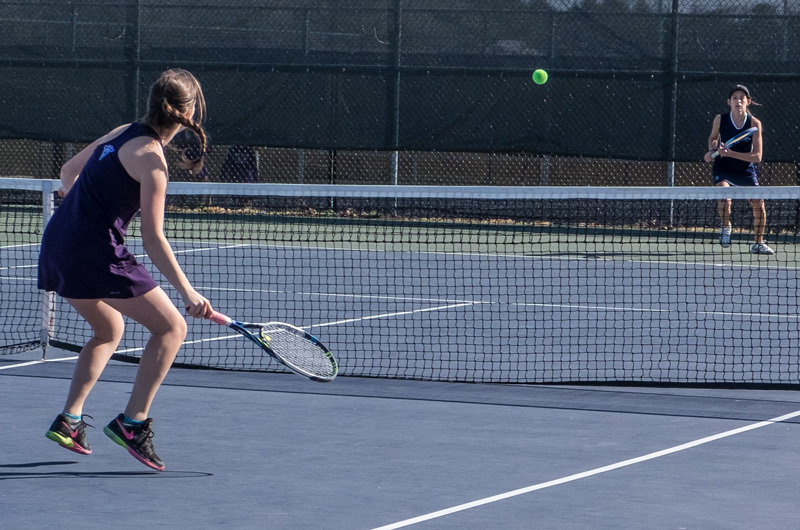 Girls tennis team is back on the courts with new young recruits and renewed vigor. Martha’s Vineyard Regional High School tennis alum Charlotte Potter watched through the chain link fence. First doubles Lizzie Williamson and Victoria Scott were playing a pair from Sandwich High School. With the spring sports season under way, the two-time state champion girls tennis team is back on the courts. In their third game of the season last Thursday, the girls faced Sandwich, a team they had never played before. When it was all over, the girls continued their winning streak that has been unbroken for more than two years. Williamson and Scott left the court after winning their match 6-0 6-0. They hugged Charlotte and began discussing a visit to the Dairy Queen, an old team tradition. Williamson, a junior, is cocaptain this year. She and Scott, a sophomore, have been dominant at doubles since last year when they claimed the Vineyard’s first MIAA state doubles championship. Due to various circumstances, this was the first game of the season where they were on the court together. Though the girls had an undeniably great season last year with a 29-0 record, they haven’t let success go to their heads. She takes her role as captain seriously and said she is excited by the team this year, which includes seven freshman, three of them on the varsity squad. Coach Nina Bramhall said the team is shaping up nicely. “It’s always hard to beat your team last year,” she said. But there seems to be an never-ending stream of young tennis talent for the high school girls team. One reason is the Vineyard Youth Tennis Center, where many of the girls start playing at a young age. Island kids receive free tennis instruction at the center, thanks to the generosity of its private benefactor. “A lot of these girls have played with the older girls at Vineyard Youth Tennis, so there is a built in comfort level,” Ms. Bramhall said. Then there is the story of the Pogue triplets — two girls and a boy who are all freshmen this year, all tennis players, and all products of the youth tennis center. Last week Molly and Paige Pogue played at second doubles and won 6-0, 6-2. Being sisters might help them on the court, they agreed. “With communication,” Paige said. Brother Spencer Pogue plays on the boys team. Meanwhile, on the girls singles courts, Kat Roberts, Kelly Klaren and Hannah Rabasca won their games, 6-0 6-1, 6-0 6-0 and 6-1 6-0 respectively. Roberts, a junior, is also cocaptain this year. For her, returning as a two-time state championship team is more burden than perk. The girls tennis team has its next home match on Tuesday, April 25 at 4 p.m. against Falmouth High School. Farm Neck is hosting the first ever men’s senior national USTA tournament in the Island’s history.